Stephen B Whatley’s work is featured on our August/September front cover and on Thursday I went to his private preview entitled ‘Paintings From Prayer’ at Westminster Cathedral (not to be confused with Westminster Abbey). I had never been inside the Cathedral before and was impressed by its Byzantine style. As I walked in I took a moment to sit on a wooden pew away from bustling Victoria Street. I looked up and there above me were these huge black domical vaulting concaves; a rather gloomy sight – not what you’d expect when you are looking up for hope. I’d read somewhere that the site was home to a former prison demolished before the Cathedral was built, and it’s almost as if, unknowingly, the dark ceiling reflects the depressive stifled hope of a jail. The organ bellowed and I sauntered over to where the art was displayed. Whatley’s work is spread across the chapels of St Patrick and St Andrew until the 22nd August. The reason I like – and I think a lot of other people like the painting is the great vibrancy. The bright colours and strokes leap across the canvas. 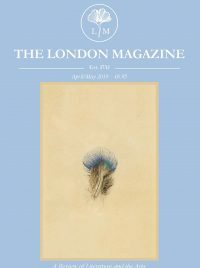 Before this preview, I was really only familiar with Whatley’s paintings of London landscapes, such as Tower Bridge (detail) chosen for our front cover. His religious art mainly comprises portrayals of Christ, the Virgin Mary, various Popes and Saints. Like a clarion the exhibition is so brazen, it even held back the beginning of a wedding! A notable painting of his is newly painted His Holiness Pope Francis on display in the exhibition along with some others that took my eye, such as Holy Mother and Child– Christmas Day, for capturing with luminosity the delicate bond of mother and child. Mary has a Modigliani-like face, as do some of the other painted faces. Several of Stephen’s paintings of saints are on show in the St Andrew chapel, which has an exquisite gold mosaic depicting the saint’s towns and relics. 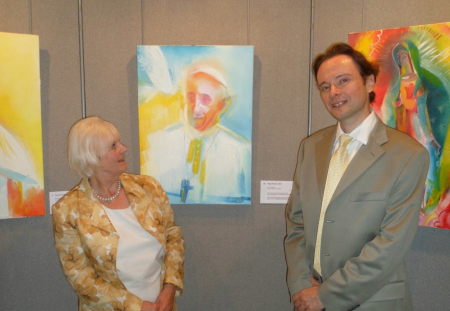 Surrounded by Catholic liturgy and veneration the Whatley’s paintings sit well and easy in the Cathedral.